Kalmar, part of Cargotec, introduces an eco-efficient reachstacker with a Fuel Saving Guarantee to customers. Kalmar Eco Reachstacker is the very first solution in Kalmar's new eco-efficient portfolio - The Kalmar Eco Range. The solution was introduced to the customers today at TOC Europe that is taking place in Rotterdam, The Netherlands on 12-14 June 2018. "I am very proud to introduce a new, eco-efficient solution from Kalmar, which guarantees to substantially cut the fuel consumption and costs, while lowering carbon emissions and helping customers meet current and future emissions standards. A couple of weeks ago, we made a very bold announcement that our full offering will be available as electrically powered versions by 2021. 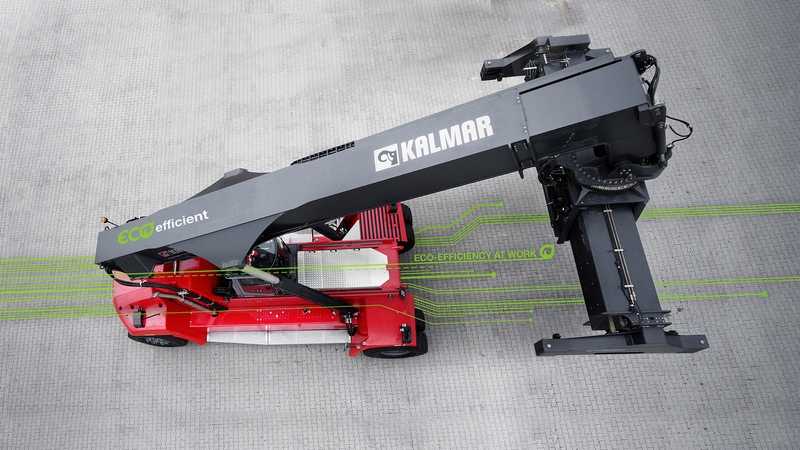 As we work towards reaching that goal, the Kalmar Eco Reachstacker is a prime example of our commitment to develop industry shaping solutions to minimise the environmental impact of cargo handling," says Dan Pettersson, Senior Vice President, Mobile Equipment at Kalmar. There are two options available of the Kalmar Eco Reachstacker. The customer can either buy the machine with the Kalmar Fuel Saving Solution, which guarantees a reduction of fuel consumption, or lease it with the Kalmar Operational Solution, which guarantees availability and performance for a fixed period with a monthly fee. In the first option, the customer buys the Kalmar Eco Reachstacker with guaranteed reduction of fuel consumption, including the operator training and a three year license of Kalmar SmartFleet remote monitoring solution that tracks and monitors the fleet in real-time. The solution guarantees the fuel consumption for each individual application and customer. Furthermore, it guarantees to cut emissions, meet current and future emission standards, provide a better driving experience as well as enhance the customer's reputation through their contribution in improving the eco-efficiency of their operations. The fuel saving guarantee will be based on three different inputs from the customer and it will be reviewed after 12 months of use. If the agreed reduction is not met, Kalmar will pay back the difference in fuel. The second option provides operational lease guaranteeing full availability and performance of the Kalmar Eco Reachstacker for a fixed period with a monthly fee. With the Kalmar Operational Solution, the customers can focus on their core business and Kalmar will take care of the rest. The complete solution will include the Kalmar Eco Reachstacker, the Fuel Saving Guarantee including the fuel it uses, preventive and corrective maintenance of the machine, tires, Kalmar SmartFleet remote monitoring system, operator training and financing for the solution. 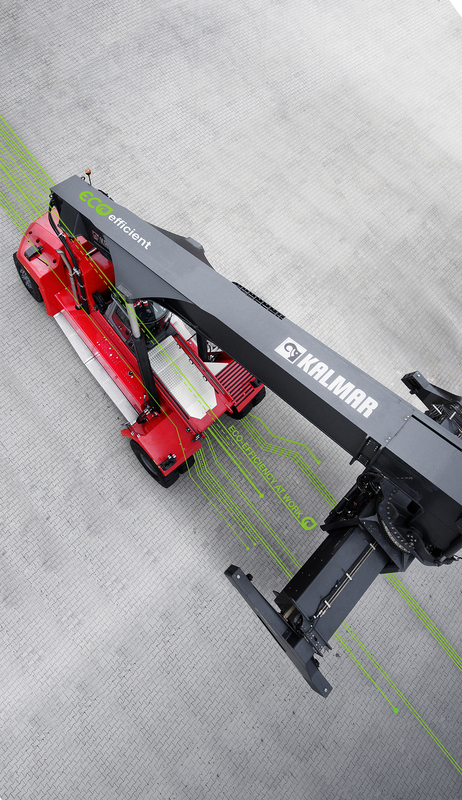 "Kalmar Eco Reachstacker represents a completely new way of doing business with us. We are ready to offer availability and performance guarantees for our customers and at the same time, help improve the eco-efficiency of the customer's operations. We are ready to offer guaranteed fuel savings, provided that the customer participates in the operator training as well as uses Kalmar SmartFleet remote monitoring system to optimise the performance of the equipment. Furthermore, we are ready to take the full responsibility and offer agreed availability of the solution for a fixed period with a fixed price," says Svante Alverönn, Vice President, Solution Sales, Mobile Equipment at Kalmar. The new Kalmar Eco Reachstacker solution is on display at the Stand E20 in the Ahoy Rotterdam during TOC Europe. Follow our TOC Europe 2018 activities @kalmarglobal on Twitter, LinkedIn, Facebook and Instagram or come meet us at our main stand F50 to find out how together we can shape the future of cargo and material handling.